Tony Wapshere was born in London, UK on 25 June 1936. His father, Leonard John Reginald Wapshere (born 13 April 1909 – died 16 March 1989) was an accountant in the City of London and during World War II was a radar operator, landing with the allied forces in Normandy on D-day+2. His mother Kitty Wainewright (born 22 August 1912 – died 8 March 2006) was a housewife. Tony and his family always lived and went to school in the east-end of London (Ilford, Essex). They survived the blitz in the family home there, and Tony spent some months as a child-evacuee on a farm near Moreton-on-Marsh in the Cotswolds, as the V2 rockets started to fall on their street in Ilford. He went to Ilford County High School (a state school) from 1948-54 and did a GSCE ‘O’ levels in Mathematics, Physics, Chemistry, Biology and Latin. This was followed by ‘A’ levels in Botany, Zoology, Chemistry and Physics. He studied for his BSC in Zoology at Exeter University from 1954-57 receiving special honours in Zooology with Botany subsidiaries. He did his PhD in Insect Ecology at Leeds University from 1957-60. From 1960-62 he continued his research into insect ecology at Leeds University as a Post-Doctoral Fellow. In 1962 Tony came to Australia as a Senior Research Scientist at the Division of Entomology, Brisbane, Queensland. He was stationed at the Division of Tropical Pastures in Brisbane until 1966. In August 1966, he and his wife and daughter travelled to Montpellier, France, where as Officer-in-Charge, he was to set up the CSIRO Biological Control Unit (now the CSIRO European Laboratory) in the CNRS Centre D’Etudes Phytosociologiques et Ecologiques. 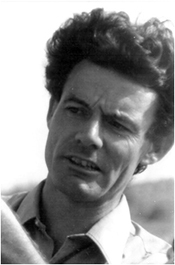 In late 1966, he went with plant ecologist Richard Groves, to South West France and South East Spain to undertake a survey of skeleton weed. The initial task of the Unit was to conduct an ecological study of skeleton weed in Europe and search for potential biological control agents. From then on, the story of the eradication of skeleton weed in Australia became intimately linked to the future development of the CSIRO European Laboratory. The group led by Tony Wapshere was outstandingly successful as they established that the rust fungus, Puccinia chondrillina, could be used to control this important weed [see Skeleton weed biocontrol for details]. A study by the Industries Assistance Commission estimated the benefits of eradicating this one weed to Australia to be worth $1.425 billion [Sheppard et al., Fortieth anniversary review of the CSIRO European Laboratory, XII International Symposium on Biological Control of Weeds]. His 1974 paper [Wapshere AJ et al., 1974, The ecology of Chondrilla juncea in the western Mediterranean. J Appl Ecol 11: 783-800] not only remains a classic description of the impact of biological control, but puts the whole agricultural management of skeleton weed in Australia into perspective. He looked objectively at which organisms were having an impact on the natural population of the weed, and avoided just looking only at insects, which was the usual practice at the time. As the skeleton weed experience had demonstrated, for the first time science had established that the most significant factor for biological control of weeds was a rust fungus. His landmark 1975 paper [Wapshere AJ, 1975, A protocol for programmes for biological control of weeds, PANS. 21, 3: 295-303] is still used to this day (2014) as a reference and forms the basis of testing programs across the world. Tony approached the problem from an ecologist’s point of view. He looked at the whole environment in which plants grew and compared it to the Australian situation. Studying the density, the weedy status, the influence of climate, soils and local agricultural practice such as frequency of cultivation, fertiliser regimes etc., he reviewed and formalised the principles behind testing programs for biological control agents for weeds. Taking advantage of the coevolution of plants and their specific natural enemies he put the emphasis on testing agents against those species having a higher probability of susceptibility. Chairman, Ecology Group, CSIRO Division of Entomology, Canberra (1983-93). Following his return to Canberra, Tony continued his work on the phylogeny of chemical and insect interactions in plants, the basis of much of host specificity. Additionally, he reviewed the possibility of biological control of grass weeds and surveyed silver-leaf nightshade in Mexico and blue heliotrope and Bathurst burr in Argentina and Chile. Tony Wapshere retired from CSIRO in 1993 but continued until 1997 as an Honorary Research Fellow and Visiting Scientist at the CSIRO Division of Entomology, Canberra. He was a Consultant for New South Wales Agriculture and the International Wool Secretariat on agents for Bathurst burr, Xanthium spinosum and on adapting the PLANTGRO computer package on insects, plant diseases and weeds’. The latter was then successfully used by agronomists and foresters in Holland, Australia, Indonesia, Thailand and formed a part of a new PHYTOWEB program developed by German scientists. In 1998 he was a Lecturer at the Canberra Institute of Technology (CIT) and a part-time scientist at Biosecurity Australia. He is the author/co-author of 52 scientific papers. He died on 15 November 2007 from cancer of the oesophagus. In 1968, Tony, along with his PhD supervisor Edward Broadhead, won the George Mercer Award, awarded annually by the Ecological Society of America to a young man who has published an outstanding paper in ecology in the previous two years.